I know I can't change the way I look. But maybe, just maybe, people can change the way they see ...Wonder is the unforgettable story of August Pullman, an ordinary boy with an extraordinary face. With over 5 million copies sold, Wonder is a true modern classic, a life-changing re... read full description below. I know I can't change the way I look. But maybe, just maybe, people can change the way they see ...Wonder is the unforgettable story of August Pullman, an ordinary boy with an extraordinary face. With over 5 million copies sold, Wonder is a true modern classic, a life-changing read, and has inspired kindness and acceptance in countless readers. Now younger readers can discover the Wonder message with this gorgeous picture book, starring Auggie and his dog Daisy on an original adventure, written and illustrated by R.J. Palacio. With spare, powerful text and richly-imagined illustrations, We're All Wonders shows readers what it's like to live in Auggie's world - a world in which he feels like any other kid, but he's not always seen that way. We're All Wonders taps into every child's longing to belong, and to be seen for who they truly are. It's the perfect way for families and teachers to talk about empathy, difference and kindness with young children. R. J. Palacio was born and raised in New York City. She attended the High School of Art and Design and the Parsons School of Design, where she majored in illustration with the hopes of someday following in the footsteps of her favorite childhood author-illustrators, Antoine de Saint-Exupery, Maurice Sendak, and the D'Aulaires. She was a graphic designer and an art director for many years before writing her critically acclaimed debut novel, Wonder, which has sold over 5 million copies worldwide. We're All Wonders, which is based conceptually on the themes of her novel, represents the fulfilment of her dream to write and illustrate her own picture book. 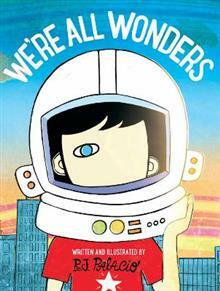 In addition to Wonder, R. J. has written Auggie & Me- Three Wonder Stories and 365 Days of Wonder. She lives in Brooklyn, New York, where she is surrounded by magical water towers, with her husband, their two sons, and their two dogs, Bear and Beau. Learn more about her at rjpalacio.com or on Twitter at @RJPalacio.